Existing users, upgrade FREE for the remainder of your plan’s monthly billing cycle. login in to your GOLD or SILVER plan and click the orange “Upgrade to Rewards” button on your navigation bar for immediate access. 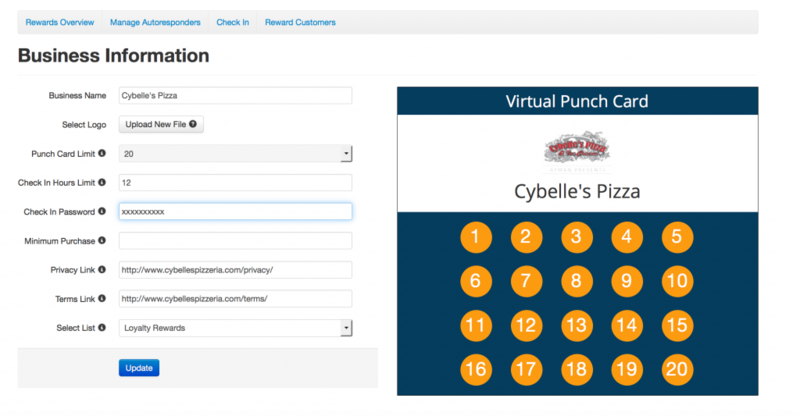 See How One Of Our Favorite Pizza Places Uses Betwext’s Loyalty Rewards Virtual Punch Cards. 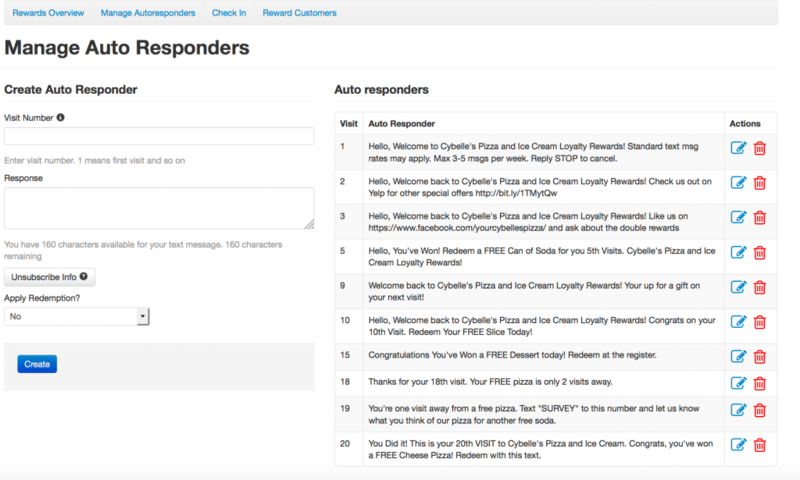 STEP 2: Customize each response that a customer receives per visit and choose which visits are redeemable. Our friend’s at Cybelle’s have offered rewards on visits 5, 10, 15 and 20. They also use the visits between rewards to showcase related Yelp, Facebook and special events. 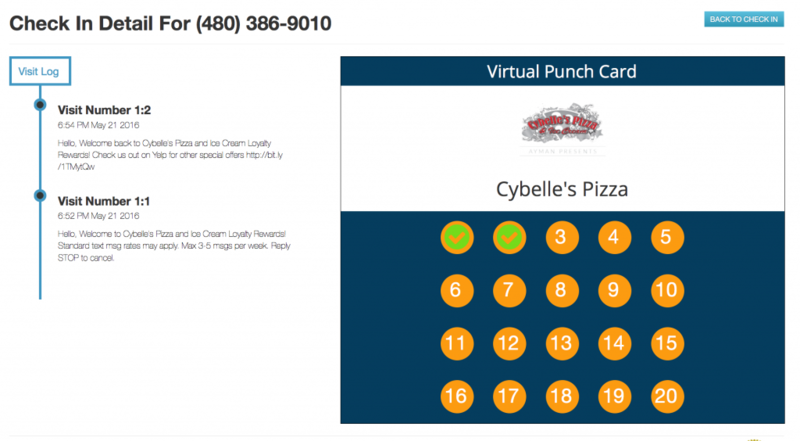 Business owners can pick what’s best for their sized punch cards (10 is the most popular). The punch cards reset after the series of visits have been completed and the rewards redeemed. Step 3: Generate your unique check-in link (just click the check in button). It can be used on any smart phone, tablet, or wi-fi enabled device, for your staff to check customers in or for you to have customers self check-in onsite. If you have a delivery service this will also work when you provide the link to your trusted employee or staff member. 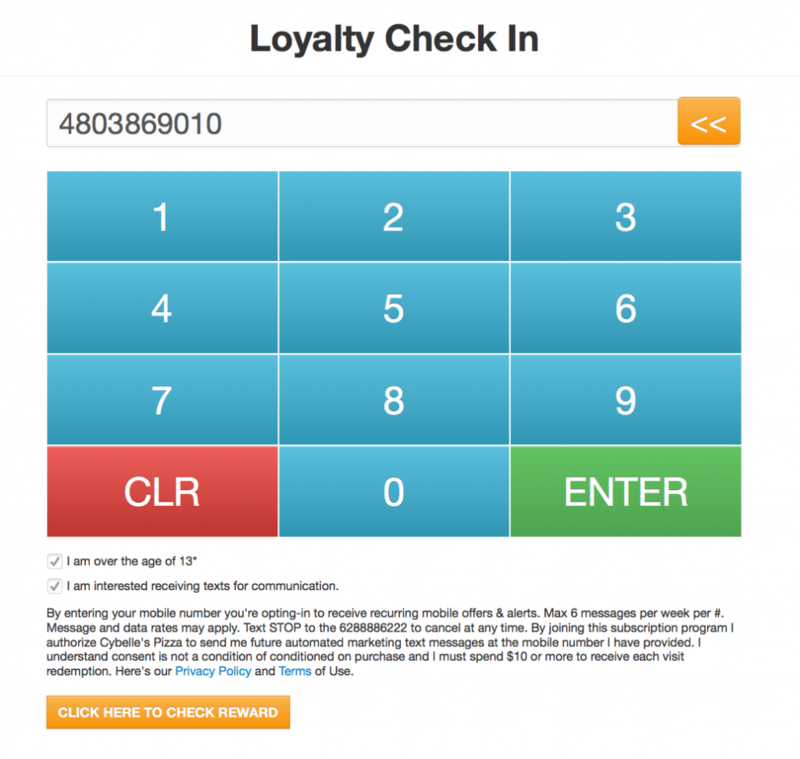 (In just seconds you can ask your customers to add their number). Want a password to protect this unique link, no problem you generate it in the business set-up step 1. Want a time limit between check-ins, no problem. Do it in minutes when you set up your business information. Optional additional information can be collected or your customers can skip this step. 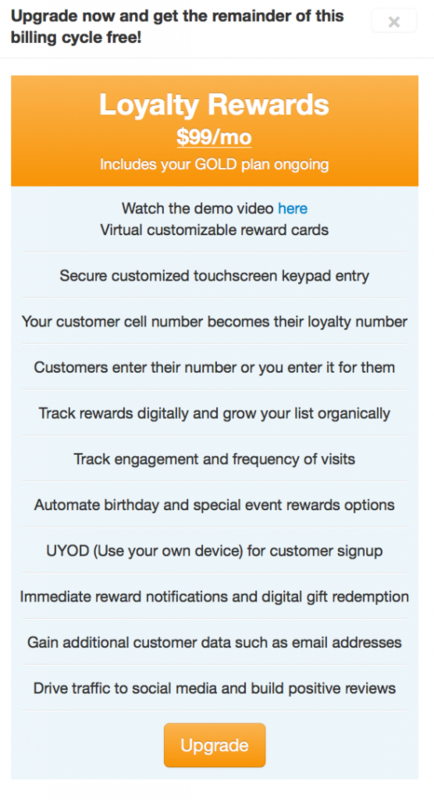 A customer or staff member can click the “redeem button” to fulfill the reward. Send as many or as few texts as you like during your customer’s visit cycle. 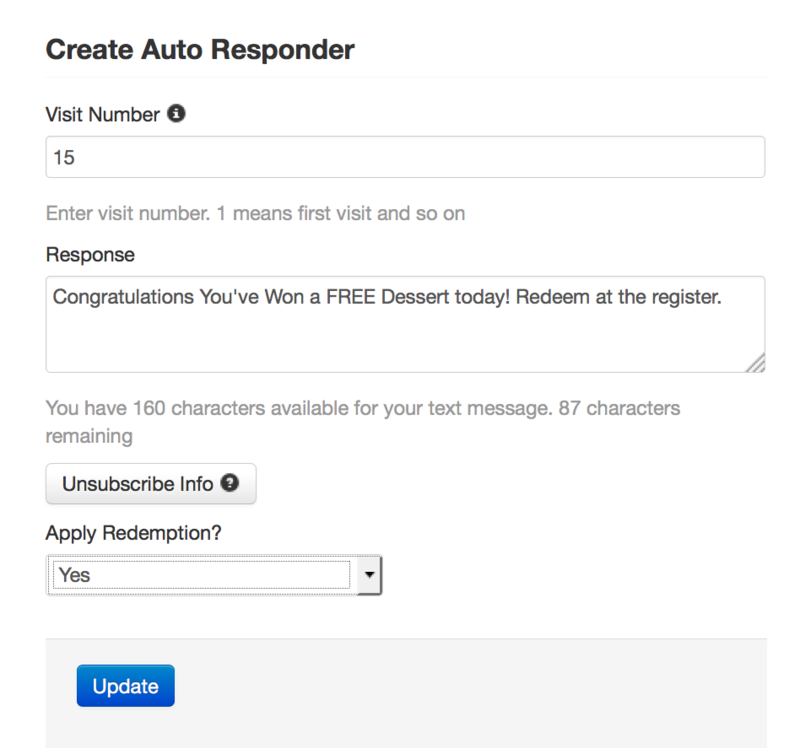 Some businesses will only send a rewards text and others may wish to send a text each time a customer visits. You know your customer best! Step 4: Business owners can edit customer information, view rich data such as lifetime visits, individually reply to guests (great for YELP reviews and other reputation management), or send a mass text to all the users in the rewards group. Remember with the Loyalty Rewards Plan you’ll still get all the GOLD plan features in Betwext. Try it FREE for the remainder of your plan’s monthly billing cycle. CLICK HERE after logging in to your GOLD or SILVER plan for immediate access. 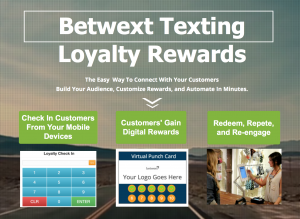 Once you’ve signed up feel free to contact support@betwext.com for a FREE Loyalty Rewards Virtual Punch Card training session.